I am SO excited to be on board with Toronto Reel Asian Film Festival this year!! Are you a fan of K-dramas? Live near Toronto? Did you love Kim So-eun on We Got Married? 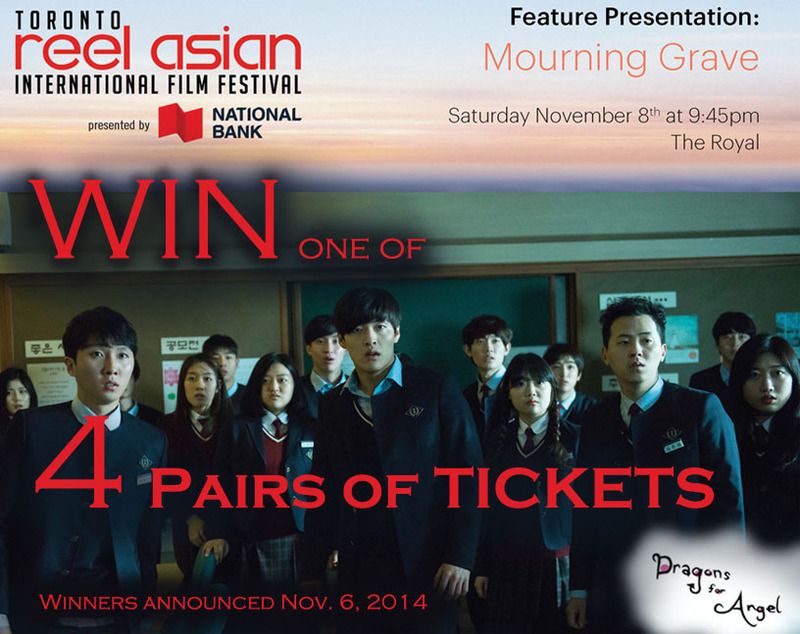 I'm giving away 4 Pairs of Tickets, the highly anticipated Mourning Grave at the Toronto Reel Asian International Film Festival on November 8! Anybody can enter, and there are 3 easy and simple ways to do so- Don't miss this amazing opportunity!! 1) Write a COMMENT at the comment of this post, saying you want to win!! 2) Share/comment this FACEBOOK POST on my fb page. 3) Share this TWITTER POST on my twitter account. SYNOPSIS: With the ability to see ghosts, In-su returns to his hometown for a normal life, but ends up bonding with an unusual girl. Meanwhile, a mysterious masked ghost has started to hunt down and kill his classmates one by one. Starring Kim So-eun and Kang Ha-neul. This will actually be the 18th edition of the film festival, and this year it runs from November 6 - 16. From what I see, it's honestly a fantastic lineup of movies and events from all across Asia. Good luck everyone entering the contest, I will release an update soon!! Official Trailer for "Mourning Grave"